I’ve profiled Marimar Torres and her eponymous estate previously, so it was good to catch up with some recent releases that are in the UK market. 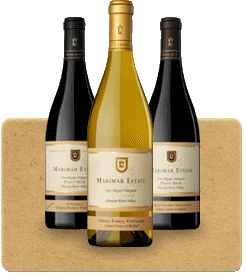 Marimar, sister of Miguel Torres of Spain, has lived in California since the 1970s, establishing her estate on a piece of land in Sonoma’s Russian River Valley in the mid 1980s, 50 miles north of San Francisco. The vineyards like most in this area are focused on Chardonnay and Pinot Noir, but Marimar has planted Tempranillo and, as you can see below, is producing a lovely Albariño too. The vines are trained close to the ground on vertical trellis, with a planting density four times greater than is traditional in California, but which is much more common in Europe where competition between vines naturally diminishes their vigour and controls yield. Wines here span 2010 (“The long cold summer,” according to Marimar), 2012 (“A simply gorgeous vintage”), 2013 (“A stellar Sonoma year”) and 2014 (“We thought it couldn’t get any better”). These are wines with lovely subtlety and made with intelligence: not shy or atypical of sun-drenched California, but always with a sense of reserve. The wines are imported into the UK by Fells. (2016) Acero is Spanish for steel, and reflects the fact that this Chardonnay is made in steel tanks and sees no oak. From the organically farmed Don Miguel vineyard, it has an an immediate creaminess and touch of almond and honey to the ripe stone fruit aromas. The palate brims with sweet creamy apple and peach, verging on tropical with its mid-palate sweetness before the fine, white fruit acidity and touch of weight and texture gives the finish savouriness and a bit of gravitas. Delicious. (2016) Another organic and biodynamic wine from the Russian River, barrel fermented and aged (40% new, French oak from Alliers), this has Marimar's signature refinement and composure, the sheen of oak carefully handled, still allowing plenty of expressive citrus and nutty apple fruit, just hinting at the tropical. On the palate good fruit sweetness immediately, then the creamy, vanilla oak fills in, but so does a gentle acidity into an easy-drinking, balanced finish. (2016) From the Doña Margarita vineyard on the Sonoma Coast, maturation was in French oak, 36% new. Fine, soft ruby and earthy colour, plemty of plum and spices, a tobacco and clove spice with chocolate tones too. In the mouth it is full and generous, suede-like texture and ripe chocolaty tannins against the pert acidity, but a fine truffly Pinot sweet earthiness propels it into the finish. This should cellar well, but is delicious now. Note, price is per bottle when purchased as a six-bottle case. (2016) What a superb, aromatic and perfumed Pinot this is from the Don Miguel Vineyard in the Russian River. Farmed biodynamically, the vineyard is mostly planted with the Swan Pinot clone, with 30% Pommard, and 10% Dijon clones. This wine is aged in French oak, 40% of which is new. The nose really is gorgeous, framing seductive berries, violet and sweet exotic spice with some earth and woodland truffle notes, before a palate that ripples with cherry and sweet red fruit, an undertow of spice and chocolate, and smooth as silk tannins against the pretty acidity. Terrific and will probably age well for a decade. (2016) Nice to find a wine with 6 years of age already, and it does show maturity in the fading rim of the garnet colour. Sweet forest floor earthiness and density, a touch of something like menthol and clove, and a nice gamy maturity. In the mouth plenty to chew over in a wine with a bit of liquorice at its core, but there is good fruit here and a nicely mellow, autumnal feel to the fruit. For drinking now (and it is reduced from £29.95) but delivering a whole lot of Pinot pleasure in a fairly robust style. This is great Tom thank you. I am heading down the Oregon coast to California in the New Year from Canada, so hope to visit some wineries in the area. Hi Lili, that will be a great trip with some fantastic Oregon wineries just an hour or so in from the coast too if you have the time. Get in touch with Marimar via her web site before your trip and I’m sure she will make you welcome in Sonoma.